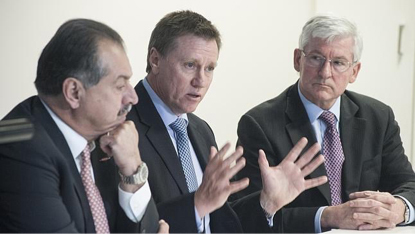 CEO of Dow Chemical, Andrew Liveris, with chairman of the AAMC, John Pollaers, and director of Resmed (and long-time CEO of Cochlear) Chris Roberts, at the launch of the Australian Advanced Manufacturing Council in June 2013. The Australian Advanced Manufacturing Council is a CEO-led private sector initiative pursuing Australian success in advanced manufacturing. The AAMC brings together industry leadership to drive innovation success and resilience in the Australian economy. Chief executives of some of Australia’s leading technology and manufacturing companies have joined forces to form Australia’s first industry-led advanced manufacturing council. There is no shortage of role models that prove that Australian manufacturers can tackle technological transformation to secure their place in global markets. Innovation and creativity are key elements enabling Australian manufacturing companies to stay competitive in a globalised economy. What will it take to have more of this success, especially in the context of the looming automotive exit and the end of the resources boom? What can we learn from others’ success – and from our own? Dependent on global supply chains. The only public sector support needed is at the Research & Development phase through tax credits or leveraging public/private partnerships. Advanced manufacturers tend to be engaged in collaborations with universities, the CSIRO and other research institutes. Advanced manufacturers sell to a global market and compete on distinctive qualities. The domestic market is not a constraint. These manufacturers constantly innovate to remain competitive. They leverage the latest thinking in technology and materials. They produce high margin products. And they have smaller capital and labour footprints but are higher paying, and provide higher quality work. Advanced manufacturers are involved in the development of new markets, new products, new technologies and new ways to manufacture existing products. The US definition of advanced manufacturing highlights not only the value of companies involved in emerging technologies, but innovations that improve processes and production.